The stirling composite door design offers installers something modern and different. With a cutting-edge look and intricate square glazing, it’s a suitable design for modern builds and can update an older looking property too. We have three new satin glass designs on our Stirling Visage composite door. 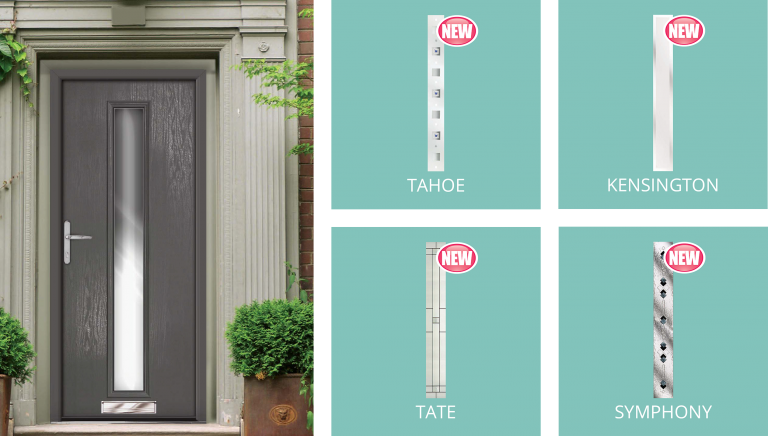 For installers looking for cleverly made patterns that make a statement on any door, our new Tate and Trieste designs will do the trick. Or if simplicity tells the whole story, then the Kensington design is a great choice. The Berkeley composite door design is great for homeowners that want to create a modern entrance on their property. Similarly, to Stirling, Trieste and Tate glass options look amazing on this door design. We have also added Nevis, a simple clean design but with a level of privacy built in for homeowners who want people to turn their heads, but not see inside. When finished with a stainless brushed steel pull handle it has a really 21st century look. With a choice of colours, hardware options and glass designs, there is almost an endless possibility of looks to order. Our Belvoir composite door has always provided an alternative look to most entrance doors. With its large glazing panel hugging the centre of the door from almost right at the top to the bottom, it really makes this a standout design. With the design so reliant on the glazing, the pattern design of the glass has to pull its weight and we have some fantastic options, including 3D appearance. We have five new options to choose from. We have added popular designs like Kensington, Tate and Tahoe but also added Symphony and Linear for the more bold, adventurous types. All our new glass designs offer a level of privacy, but all bring plenty of light into the home. If you would like to browse through all of our Visage composite door designs and glass options, you can download our brochure here. Alternatively you can speak to a member of our team on 0161 339 2433 to discuss your requirements on your next project.